The Circle of 5ths. A nice, tidy way to organize key signatures, right? Sure. But, science is behind that little concentric piece of genius. Just think about how much music is structured around that circle…amazing! Like you, I’m always looking for ways to apply proven systems to new challenges. A few months ago, I thought to myself, “How could I use the Circle of 5th’s?” Not musically….BEYOND music. Is there power in the Circle of 5ths that others could use to help them solve, well, maybe anything? I think there is and I think it has to do with us and how we communicate, organize and influence each other. At that point, I started thinking about my Circle of 5’s (C05s), collectives of 5 people I would team up with to really initiate change. For several years, I have been a die-hard social media user. I’ve taught classes on it for educators and business leaders. I have several blogs, several Facebook Pages, use Twitter and I’m a member of several professional learning communities. I’ve built good relationships from my interactions. But, one things has been missing…true change within my community. Now, I’m not slamming social media, I’m just saying that I see evidence within my life that social media has helped me personally grow, but has not really created significant community benefit, at least in education. So, before I get a ton of people sending evidence that it can and does, I agree that it can. For me, and I believe others as well, a local collective is more beneficial. Enter the Co5s. During that last several years, I’ve been attempting to bring local music educators into the online world. I’ve talked about the benefits of communicating online. I’ve shared the various resources, the links, the tools, the apps, the videos…you name it. Overall, the effort has failed to convince local educators that uniting online has value. Many just feel the personal connection is lost. Others feel that real progress is not made online, and yet others feel communicating on social media is for kids or something to do just between friends and family members. There’s countless thoughts. But, one thing remains…people want to unite personally, eye to eye, face to face. But, a simple formula is needed and I believe it is Co5s. So the challenge, gather 5 people including yourself. Pick something to change within your community and do it. A Co5 offers the perfect number of people to get the job done, but not so many as to create a need for wasted time just keeping the group together. I think this structure works at work as well. Think about the power of a Co5. The group is big enough so that one person can’t really be bossy and spoil what the group brings to the table. 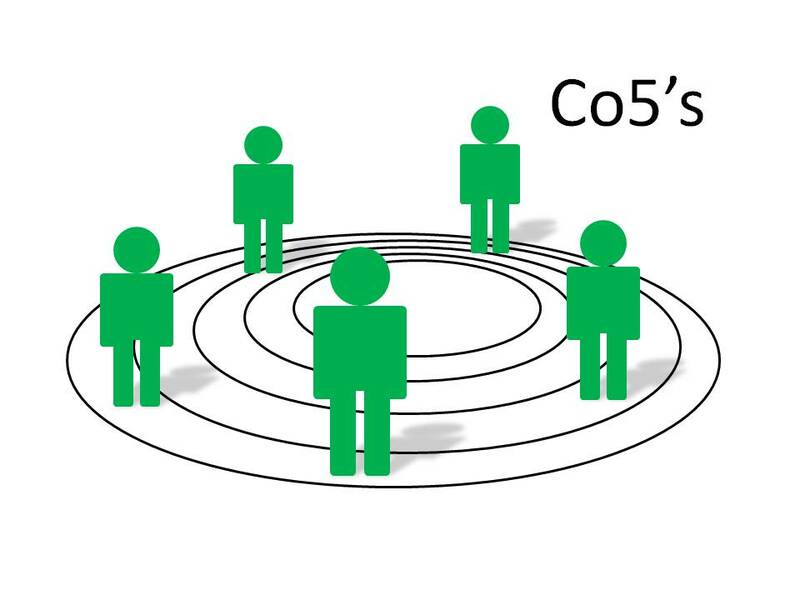 Each member of a Co5 brings their connections to the table, and with 5, those connections are extensive. A C05 can also take on several aligning efforts without having someone have to take on more than one. Lastly, if someone can’t be present at a meeting, the group is still big enough to accomplish something. These traits help eliminate what many of face when we attempt to unit within our communities with fewer or more people. Those failures lead to a lack of desire to try again. This is why C05s are so powerful. I believe we would see greater change within our communities if we simply united 5 passionate people around a cause. I am currently working within two C05s. One has been working on an online entrepreneurship project for the past several years. The other is a new C05, the TEDxBloomsburg team. I’m about to form another C05 around music education in our region. I’ve been thinking about the goals and purpose and based on my statements above, I know we need this face to face collective on our community. I have witnessed the power of C05s and can say with confidence that when approached with professionalism and vigor, they can be sustained and highly transformational. What will your Co5 take on? Are you already a member of a Co5? What are your goals? Share your experiences so others can learn. Mark T. Burke is the Founder of Music Within Me, a division of viaEdTechnologies. He is is also the author of EYE, the Entrepreneurial Youth Experience, produced by BLaST IU 17 in Williamsport, PA.